Please leave your comments below. We are always happy to hear about your diving experiences with us. We had the best diving experience that we’ve ever had. They were extremely accommodating, giving us a ride to and from our resort. We contacted 9 dive companies. They responded promptly and warmly. They were the only ones would would accommodate us doing 3 dives instead of 2 in a day. We had truly individualized service…they customized our diving sites in regard to our wants. The staff to customer ratio was phenomenal…they take out small groups. They gave instructions on each dive in regard to what we’d see, what to look out for, and potential dangers. We dove on 6 dives with them and had a blast. I wish we didn’t live so far away, or we’d dive with them all the time. After we get our kids certified, we’ll go back. Many many thanks, folks, for a wonderful week, for your friendship and for the beauty you uncovered for us. Been there on 3 visits to Tenerife, will be there on my next visit to Tenerife. Enough Said! Just a quick message to say thank you very much for giving me and my friends a great time diving with you. Jenny and Steve are far to lazy to put a message on but agree with my comments that you are really the best in Tenerife. For anyone wanting a safe, fun and varied diving holiday these guys are for you. Nothing was too much trouble, from picking us up to washing / storing all of our kit for us. Visited many different sites with so much to see, my favourite was the rays and the submarine. Highly recommend a visit to these guys, the kit is good, the dive site options are huge and above all the service is excellent. I have just returned from tenerife where I did two dive’s with at yellow mountain and alien rock. I had a great time on both dive’s. Very professional & friendly, I highly recommend a visit if you are diving tenerife… Thanks Guy’s…. I have always wanted to try scuba Diving and I finally got to this summer and Dive and Sea Tenerife. The experience was amazing and was only enhanced by the owners who made me feel very safe and welcome. They walked me through the activity and made me feel completely in control. As a result of my time at Dive and Sea Tenerife, I have decided to return next Summer to get further qualifications. I Would recommend Dive and Sea Tenerife as they make the Scuba Diving experience Enjoyable and addictive! Our second visit to Gulf de Sur was even better as we were able to book some dive trips with Dive and Sea. Probably a good idea to book before arriving in Tenerife. We went out diving off their rib, It felt more like having your own personal dive crew, four of us on the rib. I hired all of the equipment needed for diving, which was of excellent standard. My wife came on board for the jolly, and a good old gossip with Melissa! Great vis. Typical med. fish. exciting swim- through. Quite a surreal experience seeing my wife on the Yellow Submarine looking out at us through a porthole! We hope to go back for another visit very soon. For my birthday, my family and I took a vacation to Tenerife, Canary Islands. Although I enjoyed lounging in the sun, shopping and the great restaurants this beautiful island has to offer, the most exciting part about our trip was scuba diving. We spent a couple hours in the pool getting familiar with the gear, and how to handle certain situations during a actual sea dive. Because I was a little nervous, the advisors took the time to slowly go through our practice session and made me comfortable being under water. The location of our ocean dive was a very cool area with friendly and beautiful fish. I had a great first scuba diving experience and hope to do it again. As a couple we were interested in trying something new that we could enjoy together. Dive and Sea Tenerife were extremely friendly and made choosing the best way to experience scuba diving very easy. We booked one day, and began our scuba experience the next. We were made to feel very welcome and that our experience was the number one priority. We can’t recomend enough that anyone looking to experience scuba diving make Dive and Sea Tenerife your first point of contact. We are now working towards our PADI Open Water Diver certification and only hope that all our future dive experiences can live up to this first one. Thanks guys!!! I have just been to Dive and Sea Tenerife and found the whole experience easy. From all of the emails that we sent to each other, booking accommodation through them in the complex which they are located, getting there and doing 18 dives in total with two spec’s included was all no hassle to them and made my life easy. Fun to be around and very easy to get on with while offering a great service through out. Dive site were good with good vis and lots to see. Area was quite and relaxing after the dive with a late bar and lots of places to eat with in walking distance. Will be diving there again at some stage if i can. Just been diving with Dive & Sea in Tenerife, after a disastrous start to our diving holiday. We booked to go diving in Puerto de la Cruz, but when we arrived the conditions were awful with 4 metre waves! After a bit of searching the only company we could find who would help was in the south of the Island. This was not a problem as they agreed to collect us and take us diving for the day. We had 3 fantastic dives with really nice people, also staying in Puerto, and finally got to see some great dive sites in Tenerife. A great experience and we shall be coming back, but perhaps next time to the South of Tenerife where there seems to be more options for when bad weather hits. My advice is if you ever get stuck and cant dive in the North, just call the dive company´s down south and see what you can arrange, it is worth the hassle and trouble as the diving is great. Dived in Tenerife with this team and was treated very very well. I arranged a dive for my 13year old son with Dive and Sea Tenerife, all very last minute but Melissa was so helpful, great communication and very friendly. We were picked up from the hotel and my son enjoyed 2 fabulous dives, highly recommend the team-professional, friendly and generally great people that I trusted to look after my son. Been back from Tenerife for a week and suffering withdrawal symptoms! Had so much fun with Dive and sea tenerife, loads of fish, rays and even a shark !!!!!!!!!! Tenerife and diving go hand in hand for us! So many dive sites to choose from and lots to see. Next diving vacation already booked! Third visit to Tenerife with diving. Cant resit the place 🙂 Love the island, love the diving and the people are very friendly. Hurry up September for our next visit. Only did one days diving in Tenerife but really enjoyed it and coming back for more. Very professional outfit. Very helpful and a pleasure to dive with. Have just under 300 dives and have dived with a number of operators round the world and can say these guys are very good and professional. Usually we take our own kit, but given this was a small weekend break we used the rental kit which was well maintained and very new. Just came back form diving in tenerife and WOW. The highest level of professionalism. All dives with a briefing. They plan your dive and dive the plan! Very friendly service. If they say you will see a sting ray – you WILL see a sting ray. Last but not least: you cannot dive safer! A REAL 5 star dive center in tenerife. During my week stay in Tenerife I dived with Dive and Sea Tenerife. Staff was super friendly and helpful. They are really professional and I felt always safe diving with them. I consider that service was exceptionally good, because they truly planned dives taking account wishes and dive experience. I highly recommend this dive center. Going Diving in Tenerife? You have to check out these guys. Very professional dive centre. Saw some amazing rays, virtually a guarantee at one of their sites. Also got good recommendations of other things to see on the island and restaurants to try. Very friendly and helpful people, absolutely safe dive. Recommended! We did one dive in Abades. Having not dived in some months everyone was very supportive getting the gear up and running. Dive was great. Thank you so much to the whole gang! Locally owned and operated. We bought dive packages, 4 one tank dives that you could combine into 2 tank dives, for only $120.00. The price could not be beat. We did 4 one tank dives and on our second day, one non-diver in our group was able to snorkel and see the same wrecks and sights that the divers were able to see. One of the wrecks broke the surface, so the snorkeling was great. The dive instructors did not exclude the snorkeler. professionals they where spot on, more than willing to pick me up everyday from my hotel to go diving which I’ve never had before in my 8 years of diving and they new all the spots like the back of their hands! As for the spots themselves they to are fantastic! In my personal opinion much better than the red sea (a place that has been said to be one of the best). The prices are absolutely brillant I felt like diving had been made affordable rather than only for the very well off like some places feel. All in all I can’t praise Melissa and her staff enough they made my trip a dream come true and I will certainly be going back! A great trip thank you so so much guys! I returned to Tenerife recently and the first thing that I did was to organise diving with Dive and Sea Tenerife. I have dived with Melissa for many years and can honestly say that she is the Most fun instructor that I have ever encountered. Yet again I was met with fantastic service and memorable diving. I would recommend Dive and Sea Tenerife to anyone regardless of diving experience or qualification. I have just come back from another great week at Dive and Sea Tenerife and can honestly say it is always fun and exciting. You never know what you are going to see in the waters around Tenerife and for me that is part of the excitement of diving. The variety of aquatic life to be seen is amazing, there is something for everyone, from turtles, rays and angel sharks to many different anemones, not to mention the variety of crabs and lobsters. As an extra treat for me last year I even managed to see the very rare visitor to tenerife…. a manta ray! I have to say that day was the best, an unexpected but great surprise for me. Many of the dive sites that I have visited with the centre have the added bonus that there is more than just 1 area to dive meaning that the 2nd dive is in the same location but usually a different area of a bay or reef with different things to see. The staff do a fantastic job making sure I am always looked after. The centre is very professional, with safety always paramount, this does not detract from the fun and excitement that the staff have towards diving though.They are truly a great group of people. If there is anything that you want to see when you are there then all you have to do is ask, weather permitting most requests can be accommodated. The staff are very knowledgeable and have a vast amount of experience that they are more than willing to share with you. I would certainly recommend the centre to anyone, from beginners to experienced divers. Thank you everyone for making my latest week a fantastic one as always! I will be back as soon as I can book my next flights! My friend and me went on a diving trip organized by Dive and Sea Tenerife. We booked the trip a couple of days in advanced, and was picked up according to the plan. The staff was skilled and very professional. Everything is according to the PADI standards, and felt very safe. I highly recommend using Dive and Sea Tenerife if you want to go on a diving trip when visiting Tenerife. My two sons (14 and 12) completed their Open Water Diver Course. Throughout the whole process the team were superb. I arranged the course via email and the responses were swift and informative – They even arranged for the manuals to be posted to us before the course so the boys could read up. The instruction and diving were all carried out by excellent and friendly instructors who not only ensured the boys learnt everything properly, but made sure they had a really good time whilst doing it. There were one or two moments of confidence failure but these were handled really well, and i am now left with two teens who are desperate to do more! Many thanks to you all – a great outfit which i would recommend to anyone without reservation. Exceptional Instructors. They welcome you and you then become part of the Family! Nothing appears too much trouble for them. All equipment is supplied. I have done PADI Open water and Advanced Open Water with them,and will be visiting them again on my next trip to Tenerife. Last minute holiday to Tenerife turned into a week of amazing dives! As I was recently qualified for open water, a lot was learned whilst diving with this team. Resulting in a good week. We did a mornings diving today with this company. I have dived many times and found these guys to be excellent in their standard, very helpful and safety conscientiousness. I also took my little 9 year old boy who did the bubble intro to diving and he played games under the pool with all the equipment on. He said it was the best thing he did all holiday! We will be back in next year to increase our skills defo! email’s were quickly to responded too & very helpful. Dive shop is clean, organised, with decent equipment, & the staff were professional & courteous. Briefings were clear, concise, equipment always checked, & they offered to store my personal equipment in the shop. I have no hesitation in recommending to non, novice, & experienced divers. I have dived with a number of operators in Tenerife over the years and Dive and Sea are by far the best, they are relaxed, but in the same time efficient and safe, all of the dives I done were shore dives. One note would be the dives would not be suitable for anyone who was not fit as there was quite a bit of walking or scrambling down to sites carrying you kit, or just ask for boat dives. That said the dives were great especially the wreck Tabaiba. I will be visiting Tenerife probably many times in the future and will not hesitate in using Dive and Sea. Completed my Open Water course with dive and Sea and struck absolute gold. Now i am back for the advanced course. I can definitely recommend trying Dive and Sea Tenerife. You’ll feel safe (especially if it’s your first time, it was for me), have fun time and great experience overall! They’ll give you coffee, chat a little, explain everything and then take you on an adventure you’re not going to forget. All the best for you, guys! The equipment was a great and the dive was great. Lots to see, plenty of fish, a moray and an octopus. Better than I even hoped. I just returned from two weeks holiday in Tenerife and I’ve got to say that it was the best holiday ever. I got in contact with Dive and Sea, and they were able to answer all of my silly questions, and arrange my accommodation with no hassles. Golf Del Sur is not a booming holiday town, but there are plenty of good restaurants and pubs to relax and enjoy after diving. If you do fancy a “night out”, Los Cristianos is just a short taxi ride away. During my first week I completed the Open Water Course and went for a few recreational dives. I had such an amazing time that I followed it up the second week with the Advance Open Water Course. The instruction was fantastic. My instructors really took the time to ensure that I understood and was comfortable with everything involved. When we moved on to our open water sessions, the ratio of professionals to students was almost always 1 to 1. I know that may be partly due to it not being peak season, but it was very reassuring to know that the pro’s were there keeping an eye on everything. The diving was amazing, clear water, loads of marine life (it’s incredible being in the water with them, as opposed to seeing them on the far side of the glass at an aquarium), and fantastic weather. All in all, the staff made me feel like a welcome guest, and not just a customer to be run through the paces and sent on my way. I even got an invitation to join the staff on their trip to Santa Cruz for carnival… What a crazy night that was! Absolutely brilliant holiday, I’d recommend it to anyone who has every had an interest in diving. I’m already planning my next holidays to return for more time underwater. Awesome experince with the boys and girls in Tenerife. Completed my Advanced Open Water with Tenerife Scuba, what a great experience. Being over 50 I was a little nervous especially for the deep dive (not sure why now! ), they made me feel at ease and gave me the confidence that I could achieve the certification. Their knowledge, experience and ensuring my safety were first class and they are both a great laugh. I have been on just about every excursion having lived and worked in Tenerife for nearing 2 years, and without doubt this is the best trip I have been on. Always wanted to go scuba diving, the instructors were very friendly and helpful and made me feel safe during the dive. Loved it so much we went back a second day to complete the scuba diving course and earn a padi qualification. Definitely want to go back to complete my training. Spain isn’t known for it’s diving tours however it’s a very nice experience to do. They have lots of species and you will be safe under water since there aint no sharks to worry about 😉 You get a nice overview how it is to dive. Very nice excursion, it was so nice so me and my oldest son (17) signed up for diving with regulators and that was fantastic. Good instructors that speek many languages (Dutch and Spanish for example). Next time I will sign up for PADI 3 days course. I did my AOWD course with Dive and Sea, and with a big grin on my face I can only give them two fat thumbs up! Good variety of dive sites, very professional staff and good service. Thank you for a wonderful experience. This was really an exciting day scuba diving, and was the highlight of our holiday. It was the first time me and my son had tried something like this, so it was a new experience for us. To see and be a part of life under sea, surrounded by colourful fish and other sea creatures, was a unique adventure. We had beautiful surroundings by the seaside, and the instructors provided a soothing and at the same time joyful atmosphere. We felt really welcome and was taken very good care of from the time we were picked up at the hotel and until we were driven back at the end of the day. A huge thank you to our instructor for making this a fantastic experience for me and my son. We will definitely be back the next time we visit Tenerife. Great day out diving. Staff are great and really friendly. A great activity to do while in Tenerife. A combination of English, Dutch and Spanish staff made it an enjoyable experience. Their english capabilities, of the Dutch female instructor was good enabling them to answer all of my questions and we had fun conversations throughout the day. Had a great day diving with some of the Dutch people from Dive and Sea Tenerife!! I was not sure about the dive cause I had tried diving in a swimming pool before, but could not go through with it because of the pressure on my ears. Alice managed to persuade me to try and dive anyway, and I’m glad I did!! We got a lot of information before we even went diving. Everything was explained very well and in a calm and easy way by our guide, so it was very understandable and I felt very safe in the water. It was an amazing sight under water!! Seen some very nice animals including a small octopus and a SeaHorse!! Zeepaardje YaY!! I would really recommend it to other people!! It was a great day and if me and my boyfriend ever return we will certainly do it again!! Hi there, I am new to writing reviews yet at 53 years old I’m not new to many things. I wanted to give my views on a holiday diving experience with these guys which was very positive, enjoyable and would recommend unconditionally. I was out for a week and took my kit on the off-chance I might dive whilst out there. I asked the Reps in the Hotel who were helpful but their knowledge wasn’t great so I looked at Dive Centres on the Web in the area and dropped them emails. I was impressed by the friendly reply. Their reviews were good and this and their email responses prompted me to choose them. Their professionalism and attention to diving detail by their staff that was reassuring without being over the top. The balance between the requirements of diving safety and diving enjoyment was established early and in a relaxed way. I dived three times with them on a Monday morning and then twice on the Wednesday. On both days I was picked up promptly from my hotel (45 minuted away) and after the briefing was driven to dive sites- the charge to and from my hotel was covered in the cost of diving. Once wet, our diving was probably assessed and then we were given different options based on this for subsequent dives. The options were varied and we were then teamed up with similarly experienced divers. The diving was relatively straight forward yet their knowledge was excellent and they made the experience with them really enjoyable. We shared a beer with them in one of the small cafés near to their Centre which ended a good day for all. So if your new to diving on holiday or alternatively have more experience. I would drop these people an email if your in this area of Tenerife and see if they are offering the same high quality of service I enjoyed. Doing four dives in february, I found very friendly an helpful staff, working equipment, and a nice reef at Abades worth a visit. From the minute we arrived at the dive center we felt welcome, my kids had never been diving before and didn’t know what to expect, everything was explained in great detail by the instructors who were fantastic. I am always skeptical on holiday when i book a day out, we looked at some of the dive centers in a few of the other locations around Tenerife and didn’t like the look of them. Dive and Sea Tenerife is everything it advertises. I was so impressed i am booking my son to go back to complete his full certification. Just back from 9 days diving in Tenerife with these guys and had an awesome time. Went for 10 dives but ended up with 12 and my first PADI Specialty. The diving’s nice and safe, the guys are all really friendly, and the atmosphere’s nice and relaxed . Nothing seems too much bother for them – from changing your diving plans at the last minute to a lift to the next village, with advice on where to watch football, when the day’s over! The dive centre’s very popular with tourists doing their first ever dive – even off season when I was there – and those who work on the island keeping themselves occupied on their days off, and it’s easy to see why. 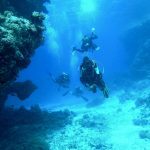 Briefing and training was available in a multitude of languages and there’s more than enough dive sites of varying difficulties to keep you interested. It was an absolute pleasure diving with these guys and hopefully I’ll be back for that deep specialty before too long! A fantastic opportunity to try something you might have always wondered about. All the guys at Dive and Sea were great, ever so friendly and professional, totally safety focused. We had a very good and, important, briefing which was to the point but delivered in a pleasant style. All the equipment was sorted out and we always felt at ease and safe with the instructors when we were in the sea. Although I was a bit nervous of it at first, as I say, the instructors make sure you know the basics before you proceed and constantly make sure you are ok. I had my 10 yr old daughter with us and felt comfortable all the time. Once you dive -its amazing. Absolutely brilliant day – don’t miss it. As a pensioner, and somewhat set in my ways – (does not feel natural to breathe underwater). I was a bit worried about whether I could do this. The staff were excellent, carrying my equipment to the waters edge and giving me ” one to one” support throughout. (Had a couple of “iffy” moments – my fault, but was well looked after). I felt very pleased with myself on completion of dive having seen lots of different fish and interesting scenery. I cannot praise the staff enough and have no hesitation on recommending them to anyone wanting to try diving. Many thanks. We as a family went diving. It was a fantastic experience. I was guided very well and my daughter REALLY enjoyed herself. A warm welcome and friendly staff. Very informative with good instruction. Very good with my ten year old too. Great local eateries to choose from at great value. Super day out and opportunity to see genuine Tenerife. First of all I must state that this diving wasn’t my first underwater experience. Unfortunately it was quite a while since I last practiced diving into the ocean so lot of help was appreciated from the instructors and they did a great job. It was my first holiday on Tenerife so I must say I will definitely visit this place again and the boys and girls at Dive and Sea were great. The place surrounding the camp itself is picturesque and after spending some time in the water one should unquestionably stroll in the neighborhood. Hope to see this place again soon. Great Day out diving. The instructor was really friendly. This day was a inspiration for me and the first step into the System of diver education in the next year. I would like to thank Dive and Sea Tenerife for posting this article. Their site is a great place to learn about, plan and even book your dive trip to their school in Tenerife. After reading this I highly recommend you check out their list of the best dive sites on the islands. For numerous travellers and tourists, the lure of relaxing on a golden sand beach provides enough incentive to visit Tenerife. However, more adventurous types will look to the sea for a greater thrill.